Hi Sis. I hope your blog will make people more empathetic towards people going through what you both went through. After ages I am reading something real. Your post gave me goosebumps. It's life, move on..Time will heal every thing. Regards Pallav. It's one of the most common problems around. I am glad your husband is so supportive. BTW, adoption is a nice idea. A fren of mine is going through the same phase though in her case there is still some hope but I know what you are going through. It must be difficult specially when you know you are being judged by all and sundry. Just cheer up and smile rest all will fall in place automatically. Hugs, LP. You are so incredibly brave to just post about this. Hugs and all rye best for everything. Thanks Ritu. I agree the nesting instinct is difficult to shake off...I am trying to be strong. Welcome back Vinita! Writing about your ordeal can be cathartic. And I've always felt that God has a plan for each one of us. We just need to be patient. That is the plan. I wanted to share my feelings so that I could reach out to others who are in the same boat. Thanks Namrata. My husband is my soulmate. I am not against adoption. It is just that people throw that word in my face when they know I don't have children and that is what makes me angry. Thanks Purba...It was cathartic to write about my situation. I am blessed in all other respects except this. I am trying my best to remain calm and strong..
Sis, big hugs. It takes a lot of courage to write what you have written. Well written. Vini - I decided to comment here instead of cluttering your FB feed. I lost what I typed there forgive me.I sit here at work fighting back tears while you are processing all this upheaval. I hope your blog is a source of information to some hapless woman googling her symptoms or for the word adenomyosis. I know I stumbled upon writings of very articulate women who usually wrote a no holds barred version of their struggles with fertility treatments. Know that you are in my thoughts and best wishes going forward. I highly recommend martinis and a vacation. Martini's and vacations it should be. That was really good writing. sorry to hear that but you have always been a very strong girl and you will find a way out, just follow your heart and seek happiness. Give love to hubs as well. Hugs LP!! I am speechless and can so very relate to your situation... have gone through some of it long back (the comments, the incessant advice, a miscarriage, the visits to the labs, doctors...) , and then finally Aaryan came in our lives! Stay positive and strong! Am glad you are moving in the right direction! Take care and loads of love, dear friend! You are an incredibly brave lady to express what you have above. I say this from experience. We are married for 14 years and have been through all the above trials and pains, repeatedly. My wife , perhaps, faced the greater trauma , but I tried to be around holding her hand- firmly. We are in the final stages of adopting a child at the moment but the pain remains as a constant wound at the back of our minds. Hope that you have the strength to face life as it has presented to you. I loved your suggestion of Martini and a Vacation :) It took me many weeks to pen this post. It was difficult and also painful. I am hoping that my post inspires others to talk about their problems. Hey thanks Anirban. I am dropping you a mail. V, have been in a state of really really hectic work, leaving no time for even a sigh, forget looking at my blog. But seeing a link for a new post on the messenger made me get here...There are two points where I empathise...yes, not sympathise but empathise...Every time I talk about wanting to have a child, there are people who advise me ( I don't doubt their intentions) that when there are so many orphan children out there, why do I need to have a child of my own, why not give a life to a little one..to all of them, I have always explained that I am selfish enough to want to experience those nine months of nurturing a life within, bringing up a child for a lifetime afterwards is the only experience I can replicate through adoption. And the second, is the constant state of self-doubt- in my case, being a single woman, the odds are anyways stacked and those to judge even more...So finding the right time to do it is as equally important as deciding how to do it..and once those factors are sorted, then the thought of whether biology will let me have my child. I just hope that your innate sense of humour and maturity sees you through this difficult phase...I can endorse that writing is catharsis..I have got over several demons and learnt to put setbacks behind in this manner..So I'd just say a great start...and I will soon be in your part of the world to catch up with you for that long-pending cuppa...:) Much love!!! Congratulations love!!! How many buckets did you fill while writing this? I filled one while reading. I don't know what to say. Love you both. Take care. Deeps...I guess desiring a child is a women's natural instinct and adoption is not the answer for everybody. When people make such suggestions..they are being insensitive as it is often suggested by those people who have their own biological children. This to me sounds very hypocritical.. I know of a single woman who went ahead and too help of a sperm bank to have a child. Things are changing in India and our mindset too has to change. Thanks Naoman...I hope that this post is helpful to many who are going through the same thing as I am. Please do share it with your friends.. Thanks for the hugs Deepak.. Thanks Choti...dropping an answer to your mail..
Hey Vinita, it was very brave of you to not only have faced insensitive people and their nosy questions all this while but also come out and share the pain. I am sure it is cathartic and helps you when we send you our love and hugs. I can only wonder at the ways of God who gives children to those who do not appreciate their worth and deprive those like you. There are no words that I can say to make the pain less, but here is a hug -- maybe it will help. Zephyr..Thanks for being so supportive. At this moment hugs and wishes are what I need. Though I am inching everyday towards a person I was, I still have a long way to go but I am determined. I know you have heard it umpteen times now, but really Vini, you are a brave girl to have shared your difficult times. I am glad that your husband is your proverbial rock and hope that you both find the understanding & love that you will need to get along with life. Thanks Ramya for your kind words. It was tough to pore out my heart cause I thought people will be judgmental but everyone has been super supportive till now. Hey gal, be strong... i know it pinches... One can always consider adoption if things don't work out otherwise, its a wonderful thing to do to help a needy child and give him or her a good life while having a child to love. I'm so sorry for your loss. It is a loss and I believe when we suffer important losses we must allow ourselves the time to grieve. Sending prayers and love your way. The sun will shine again for you and you will feel complete. Ashima..thanks for your comment. Adoption is an option but is not the answer for everyone who cannot have children. I believe that the person needs to be ready to accept someone else's child in their life. Hi, Stumbled upon your blog by blog hopping. My prayers and hugs to you. From my experience, My aunt delivered baby after 5 years of married life. So I completely understand. There was this couple who lost bot the sons at the same time. I still curse God why on earth he gave them kids. They lived happily and loosing kids at the age of 19 and 23 is the worst thing that could happen. Please be strong. Take your time. Time heals everything!! All I want to say is thanks for writing this in the blog and sharing with us. I admired you before and now I admire you even more. I want to say I love you. Please start blogging again because you are special and you write with your heart which makes your blog special. I will say take your time to grieve because only then you will be ready to move on and I do believe you have lot more strength inside you which will help you to become a new Vini and I am sure this VINI will be ROCKING. 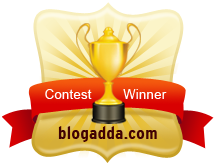 Thanks Ramya for hopping to my blog. I agree time heals everything. It is too soon to think about adoption as I need more time. I am thinking of all the options. Thanks for your kind words and please do visit again. Thanks L.C Griffith for your support, love and prayers. I am getting there slowly and trying to heal. May God give you strength and peace of mind to get over this difficult phase of ur life...stay brave..Have Faith!! Yes life does go on but at the moment we are struggling to be normal. I commented on your blog and am sorry that you and your wife have to bear this pain.. I only know you through the online world, a forum which makes pain seem unreal and distant, but your post touched my heart. I only wish that you didn't have to go through these situations at all. My profoundest respects to you and to your husband. Thanks Anirban for your comment. I read the article that you have shared here and found it to be extremely moving. I am thankful for your kindness. Very well written. I do hope you will share this with your infertility doctor as well ! Hi Dr. Malpani..Thanks for your comment. I will surely do so. Thanks for your suggestion..
Vinita, it takes a lot of courage to write about something so painful because it feels like we are laying bare the raw wound. But, sharing does help healing. Words are inadequate to express how I feel. I am sending you strength and hugs. Life teaches you ways of dealing with pain. LP, I know you'll find the strength to get through this, to accept the unacceptable. No amount of words positive or otherwise will console you as much as you can console yourself. But I am going to say this. Thank you. You have no idea how much this post of yours will help others. I say this because I personally know someone really going through what you went through. They haven't been told they're infertile yet, but they have been through multiple cycles of failed IUI. I am still hoping for something positive, a miracle maybe. But this post will give them a lot of strength and courage to go on. I hope you find your peace LP. In an adopted baby or in life's other pleasures. I know the idea of having someone's else's child is not the same as having your own and one really has to be ready for it. I know that life's other adventures might not fill the void, but its a start. Stay strong. Please. God bless. ... God Bless u both always! Thank You Deepa. Yes, no amount of positive words are making an effect on me at the moment. I need the time to grieve to move forward. I hope your friends hear something positive. My very best wishes for them. Please do ask them to contact me if they want to talk. Thanks again for your comment. Hi Sunnyflower..you are going through a very difficult period and I can understand how you feel. It feels that you are on a different planet and no one can understand you.